On March 2nd of 2013, SCHEELS opened a new 100,000 square foot Scheels at Viking Plaza in Cedar Falls, IA. The store originally opened in 1977 in the Blackhawk Mall. In 1999, SCHEELS relocated to the College Square Mall in Cedar Falls. The Cedar Falls community now enjoys a shopping experience like no other. Unlike a typical sporting goods store or department store, the new Cedar Falls SCHEELS is a collection of entertainment venues, as well as women?s, men?s, youth, specialty, and sport and game shops. Brand-name concept shops by Nike, adidas, Under Armour, Columbia, and The North Face will keep you active in any season. Each shop is staffed with experts who are passionate about their sports. Cedar Falls SCHEELS features boutiques ranging from technical running gear and the latest fashion sportswear to spectacular hunting and fishing shops. The athletic shoe, hiking boot, and casual footwear selection is the largest in the area with everything from toddlers to serious climbers, and selections ranging from beach sandals to fashion boots for women. For passionate local sports fans, the Cedar Falls store has the largest selection of clothing, caps, flags, and hats to cheer on your favorite local college and professional teams. Outdoor enthusiasts experience world-class shops including golf, bike, ski, paddle, and sport and game shops. The gun and hunting shops house the largest retail selection of guns in the region, ranging from everyday shooters to collectible guns. 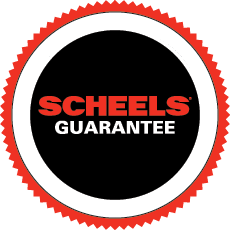 SCHEELS offers a complete Service Shop with services ranging from bike repairs and skate sharpening to ski/board waxing and racquet stringing. Each SCHEELS store has an in-house service technician team to get your gear ready for the season. Our Barnett-certified technicians have received the best bike mechanic training in the industry, and are ready to use their skills to keep your wheels on the road. Several shops feature Scheels Outfitters products. Since its conception in 1902, Scheels Outfitters, a premium brand of SCHEELS, has outfitted the outdoors enthusiast with everything from camping equipment to hunting clothing. Designed for field experts, by SCHEELS Experts, Scheels Outfitters is a premium brand that is exclusive to SCHEELS. Greeting you at the store is Gramma Ginna’s Coffee and Fudge shop: A perfect place to relax, recharge, or find a delicious gift for friends and family. Gramma Ginna’s serves 24 flavors of fresh homemade fudge, Bavarian Roasted Almonds, and Starbucks® coffee. The store features a “try before you buy” archery range, where you can also find our expert bow technicians, who are equipped to take care of your bow tuning needs. Many more amenities make this shopping adventure unlike anything the retail customer has ever experienced.